The Euronext Cash Level 2 product provides real time tick by tick level 2 (full market depth) data for Euronext Cash Markets; Amsterdam, Brussels, Lisbon and Paris. The Euronext Cash Level 2 product provides real time market data traded prices, quotes and order book data for the Euronext Cash Markets. 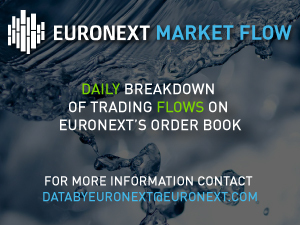 It allows traders to view the full market depth order book by disseminating each individual order, therefore offering the greatest level of transparency into the Euronext Cash Markets. The level 2 service also provides the best ten bid/offer quote limits.